True Frozen Shoulder, or adhesive capsulitis, only occurs in up to 3% of the population, and is characterized by stiffness and pain in your shoulder joint. Signs and symptoms typically begin gradually, worsen over time and then resolve, usually within one to three years. 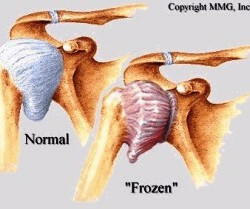 The cause of spontaneous onset frozen shoulder is unknown, however you are more at risk of developing the condition if you are female, between 45 and 60 years of age, and have had recent shoulder surgery or injury. Approximately 20% of people who have had a frozen shoulder will also develop frozen shoulder in their other shoulder in the future. By definition, the term, ‘adhesive capsulitis’ means that your shoulder pain and stiffness is a result of shoulder capsule inflammation (capsulitis) and fibrotic adhesions that limit your shoulder movement. – Freezing –a progressive loss of range of movement. These first two stages are known as the RED phase due to the capsule colour if you undergo arthroscopic surgery. – Frozen – minimal pain, with no further loss or regain of range. Known as the PINK phase due to the capsule colour. – Thawing – gradual return of range of movement, some weakness due to disuse of the shoulder. Known as the WHITE phase. Treatment for frozen shoulder involves range-of-motion and strengthening exercises, including hydrotherapy, and sometimes, corticosteroids and numbing medications injected into the joint capsule. In a small percentage of cases, arthroscopic surgery may be indicated to loosen the joint capsule so that it can move more freely. If you do have a shoulder or arm injury, it is always advisable to seek the professional advice of someone such as your shoulder physiotherapist about exercises to help prevent a secondary frozen shoulder developing. This is especially important if you are in a high risk category. 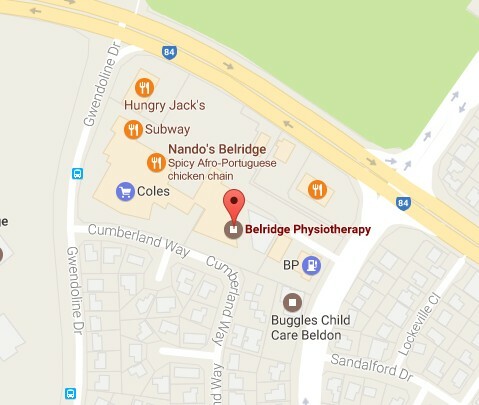 For more information, please contact your Belridge physiotherapist.